Naturally, elephants would come across many new and old occurrences in their daily life. 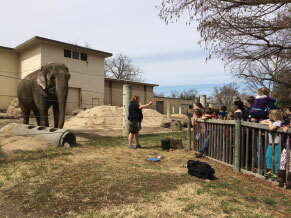 Animal Care staff at the Topeka Zoo promote species appropriate behaviors throughout the day for the physical and mental well-being of the elephants. Collectively, we call these different sensations “enrichment.” Enrichment is provided throughout the whole zoo for the benefit of the animal collection and can be done with any of the five senses: taste, sight, smell, touch, or sound. Taste is an easy category. This is anything that the elephant might sense by putting it into its mouth, like food, or licking, such as with a salt block. Our elephants are offered their daily hay, several different types of produce, browse or tree branches and other healthy food choices. This can be offered in a variety of ways to encourage reaching, foraging, and pulling behaviors. Different textures with varied terrain and hard and soft surfaces provide tactile enrichment. Soft surfaces promote behaviors of foraging, wallowing, bathing, digging, and resting. Hard surfaces promote natural and normal wear of footpads. 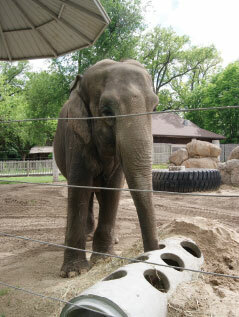 Their trunk is very sensitive and an important sensory tool for touch as well. 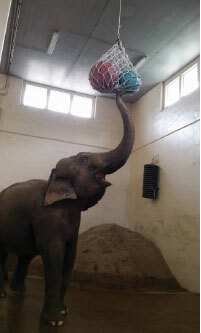 The trunk explores objects, emotionally connects and communicates by touch with the herd and with elephant trainers. Food can be a smell as well as a taste, but sometimes keepers can also offer a smell just by itself. For elephants they may sniff out – herbs and spices, perfumes, flavors, juices, scents in the air, flowers, leaves, branches, new dirt, and much more! These scents can be scattered in the habitat, placed on objects, or buried in the terrain. Sound is an instrument used to provide awareness of our surroundings and the activity going on around us. Elephants have a vast range they can hear acoustically. They can hear low frequencies that we cannot, and communicate with different sounds and frequencies. Elephants hear a variety of sound and noise of natural and manmade origin. Stimulating sounds can be as simple as a light switch turning on, traffic, music, other animal communication, or insects flying by. Sight is anything that the elephants can see. 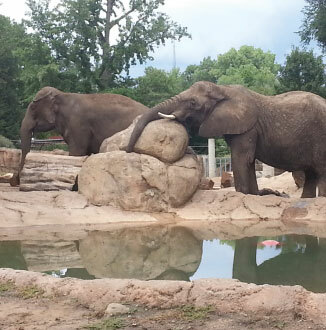 The elephant’s habitat is enhanced at least three times a day, to provide new things to explore and see. The elephant team may be seen turning up the dirt, making new mounds, or adding new logs and toys. Using the entire habitat and its levels, objects can be seen above and at ground level. Each and every visitor is visual enrichment! An Elephant program provides a complex physical and social environment which stimulates natural behaviors, social interactions and activity levels resulting in healthy, well adapted elephants. 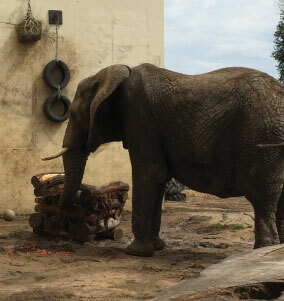 The Topeka Zoo participates in an IMLS research study that is trying to determine what amount of activity, or what daily walking distance is most appropriate for optimal elephant welfare. 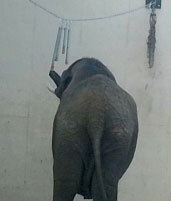 The basic needs may be different for each elephant. Since the goal is healthy, socially well- adapted elephants, how it is achieved is less important than that it is achieved.